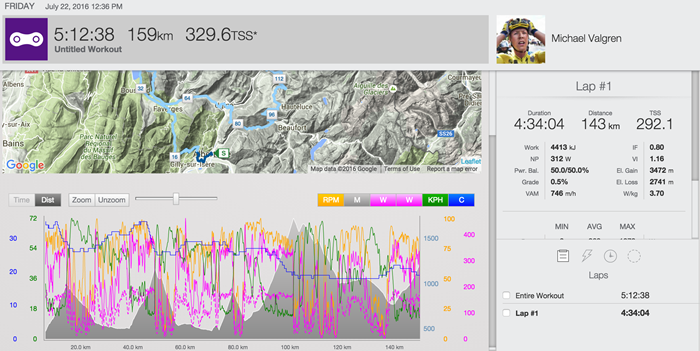 View Valgren’s full SRM power file. Valgren’s Peak One Hour Power of 303W, or 4.19W/kg was set at the start of the stage climbing the Category 3 Cote de Saanenmoser. His Peak 20 Minute Power was set later in the stage at the start of the Category 1 Col de la Forclaz. Valgren averaged 352W, or 4.86W/kg at 20.5kph (12.5mph). On the final climb of the day, up the Hors Category Finhaut-Emosson, Valgren was still able to average 302W, or 4.17W/kg for just over 40 minutes. Overall, Valgren averaged 245W, or 3.38W/kg, had an Intensity Factor® (IF®) of .77 and had a Training Stress Score® (TSS®) of 308. The second individual time trial of the tour is quite a bit different from stage 13, as it is the first mountain time trial in the Tour since 2004. Stage 18 starts with a flat 4 km out of Sallanches before turning up the Côte de Domancy, a short but steep climb at 2.5 km with an average grade of almost 10%. From there, riders will continue to climb roads with gradients around 4% towards the Côte de Chozeau, which kicks up to 5.4% for 3.1 km. After cresting the top there is a non technical 2 km descent into the finish in Megève. View full pre-stage analysis and predictions for tomorrow’s stage from Best Bike Split. View Valgren’s full SRM file. The first 3.5km of this unique uphill time trial started on a flat grade. For just over four minutes, Valgren averaged 405W, or 5.59W/kg at 51.4kph (31.8mph). At the start of the climb, Valgren increased his effort. He set his Peak 10 Minute Power of 418W, or 5.77W/kg in the first 3.5k of the climb. 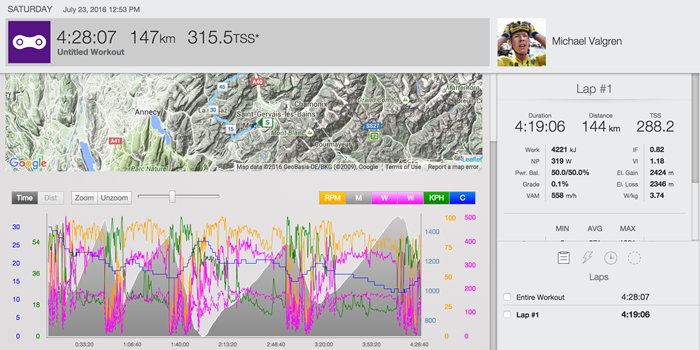 Overall, Valgren averaged 390W, or 5.39W/kg, at 94rpm and burned 773 calories during the 33 minute effort. 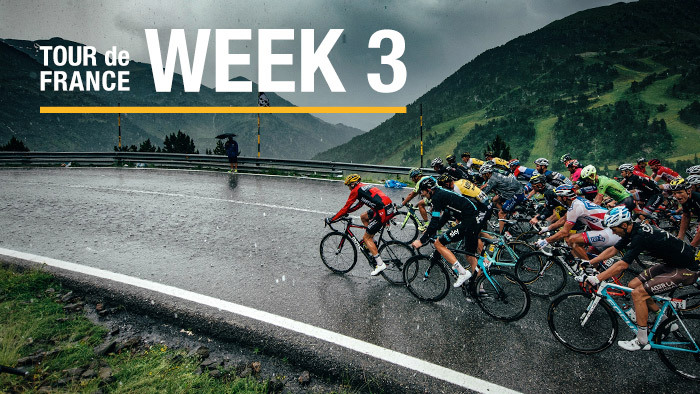 The 3rd stage in the Alps shouldn’t be as tough as stage 17, but does feature four categorized climbs and starts on a non categorized, but difficult climb right at the start out of Albertville. The course winds its way around the alps from one climb to the next with only a few sections of respite on the run into the intermediate sprint point at Doussard and the long descent after the category 1 Col de la Forclaz de Montmin, which at 9.8km features and average grade of 6.9%. When riders reach Ugine, the real race will begin starting with the category 2 climb up Col de la Forclaz de Queige which is immediately followed by the Hors Categorie Montée de Bisanne, a monster climb at 8.9% average grade for 12.4km. At 125km riders will face a steep technical descent into Domancy. The final test will be the 9.8km ride up Le Bettex at an average grade of 8%. Just 40km into the stage, Valgren set his Peak 20 Minute Power climbing the Category 1 Col de la Forclaz de Montmin. He averaged 357W, or 4.93W/kg while averaging 20.9kph (12.9mph). 40km later, Valgren set his Peak One Hour Power while ascending the Hors Category Montee de Bisanne. He averaged 321W, or 4.43W/kg and gained 1206m (3956ft) of elevation. On the final climb to the finish up the Category 1 Le Bettex, Valgren put out 306W, or 4.23W/kg for 36 minutes. Over the entire stage, Valgren averaged 245W, or 3.38W/kg, burned 4617 calories, and gained 3052m, (10,013ft.). The final day in the Alps is also the last place for any GC contenders to make moves before heading into the finish in Paris. Stage 20 is a shorter but intense stage at only 146.5 km it features four categorized climbs. Starting out in Megève, riders will head southwest through rolling terrain till the course turns north at Flumet. From there riders will face the Category 2 Col des Aravis before the easier of the two category 1 climbs, the Col de la Colombière which features an average grade of 5.8% for 11.7 km. After a long descent into Marignier, the riders will turn east and start the 13.9 km, 7.1% climb up Col de la Ramaz. The final test for climbers and GC riders will be the Hors Categorie Col de Joux Plane with an average grade of 8.5% for 11.6 km. Cresting over the top, there is a steep descent into the finish in Morzine-Avoriaz, not unlike stage 8 where Froome attacked into Bagnères-de-Luchon. Despite four categorized climbs on the stage, Valgren hit his Peak 5 Minute Power at the base of the first climb, the Category 2 Col de Aravis. He averaged 403W, or 5.57W/kg and 35.4kph (21.9mph). Climbing the Category 1 Col de la Colombiere, Valgren averaged 333W, or 4.60W/kg for just over 30 minutes. His Peak 20 Minute Power was set on the lower section of the third climb of the day, the Category 1 Col de la Ramaz. He averaged 373W, or 5.15W/kg and 22.1kph (13.7mph). On the final climb of the day, the Hors Category Col de Joux Plane, Valgren was still able to put out 335W, or 4.63W/kg for 40 minutes. Over the full stage, Valgren averaged 265W, or 3.66W/kg, had an Intensity Factor® (IF®) of .81, and had a Training Stress Score® (TSS®) of 293. The final day of tour is only 113 km. Starting in Chantilly riders will head south towards Paris. The only categorized climb is a very short category 4 climb up the Côte de l’Ermitage, which is only .9 km long at a 7% grade. The course turns east at Suresnes to head into Paris for the start of 8 laps of the Champs-Elysees to end the 103 Tour de France. On the final stage, Valgren saved his biggest efforts for the end. His Peak One Hour Power came on the Champs-Elysees where he averaged 275W, or 3.80W/kg and 48.9kph (30.3mph). 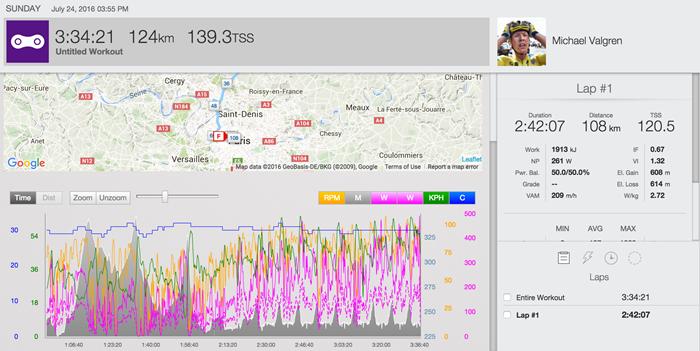 His final 20 minutes was also his Peak 20 Minute Power where he put out 320W, or 4.42W/kg at 52.1kph (32.3mph). In the sprint to the final finish of the Tour, Valgren put out his Peak 2 Second Power of 956W, or 13.2W/kg at 66kph (40.9mph). View power analysis from week 1. View power analysis from week 2.